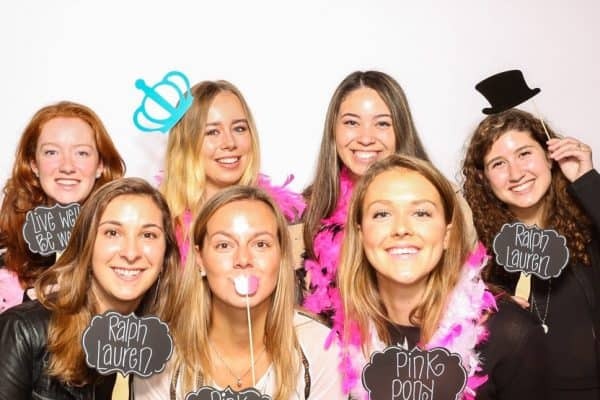 Meet Carley Sambrook, a senior who has recently discovered her passion for fashion – and now has the know-how to explore it thanks to the Fashion Career Trip to New York. Okay, so W&L offers a Fashion Trip? How did you hear about this? Have you been involved with fashion in the past? I am lucky to be a Career Fellow in Career Development, so I was one of the first to hear about this amazing trip! I have spent the last two summers working in fashion in New York City, so I went on this trip to continue to develop my network within the industry and specifically within W&L. Did you want to be in fashion when you were young or did you have other plans? I wanted to be an astrophysicist. I am a secret nerd for quantum mechanics. As a First Year, what took priority — fashion or quantum mechanics? I knew I wanted to pursue a degree in business administration with a focus on romance languages, which hasn’t changed. I come from the French part of Canada, so speaking multiple languages has always been important to me. Then, I began exploring the fashion industry, which is the perfect area to combine my love of business, creativity and international exposure! Has W&L been supportive of your goals for fashion? 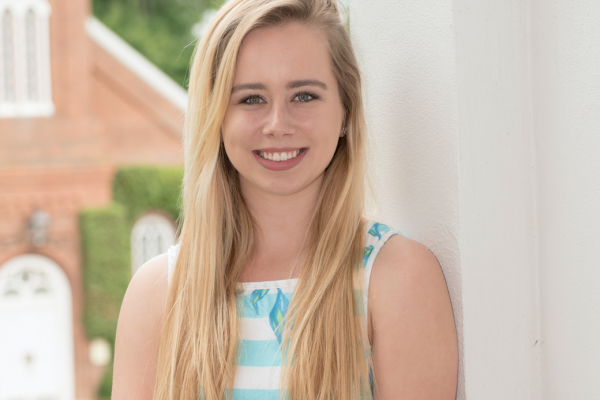 The liberal arts education provided by W&L has been extremely important. It has allowed me to hone a variety of skills that I can apply to my chosen field. I have had exposure to all aspects of the business world: entrepreneurship, finance, marketing, technology, law, writing and more. On top of that, I have taken courses in science, politics and art. Everything to which I’ve been exposed at W&L is relevant to the fashion industry, so I will graduate confident that my knowledge and skills will help me throughout my career. So the career trip must have been special — all about fashion. Did you learn anything special? Speaking with W&L alums who have been successful in the fashion industry was motivating. This trip furthered my excitement about the year to come. I have a lot of decisions to make with respect to my journey upon graduation, and I am looking forward to the process. I hope to be able to talk about my career one day with the same excitement and passion as the alumni with whom we spoke. Where did you go on the trip? We visited with alumni and other contacts from nine different companies: Ralph Lauren, Valentino, Michael Kors, Chanel, Joor, Macy’s, Neely & Chloe, Gap and J.Crew. 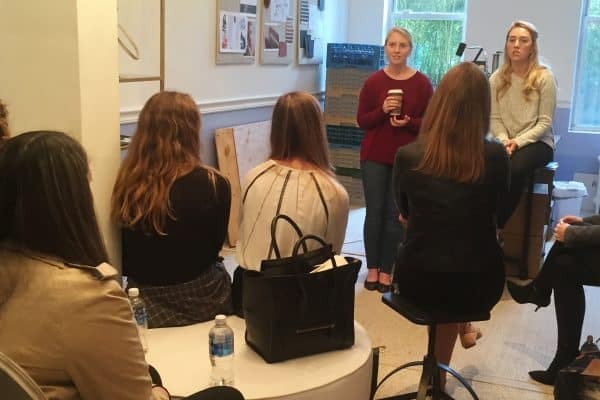 We were lucky enough to visit many of the actual corporate offices, which was a great opportunity to see the inner workings of the business behind a major fashion house. The men and women with whom we met talked about their career paths, their current jobs, and their aspirations, and also took questions from our group. It was amazing to see how passionate these individuals are about their jobs and the industry as a whole, and how excited they were to share their experiences with us. Wow! That’s a lot of fashion in a short amount of time. Was there any one place in particular that stuck out to you? My favorite visit was with our alumna at Valentino. I’d met her previously, so it was really interesting to learn about the changes in her career since I’d seen her. It was great to hear her speak about her journey throughout the industry. I was so inspired! I hope to one day have a career as developed as hers. One thing she said to us that I think applies to any job application is to know your strengths and how they apply to the job at hand. You need to know why you want a job, as well as why the employer should want to hire you in particular. Do you have a fashion mentor that you turn to for inspiration? I am inspired by Tory Burch. I worked for her company this past summer, and I am in awe of her. Not only has she created an influential American fashion brand, she also has a wonderful foundation that empowers female entrepreneurs. I admire her tenacity, generosity and eye for beautiful product. Working for her company was a dream; the culture is welcoming, motivating and focused, and I developed valuable skills throughout my time there. Okay, reflection time. What would you tell your First Year self if you could tell her anything? It’s never too early to start planning. Whether you think you know for sure what you want to do or not, there is something you can do to prepare for internships and job opportunities in the future. You can perfect your resume and identify holes in your experience, network with alumni and other contacts, and develop cross-functional skills that will help you in whatever direction you follow. In that vein, visit Career Development early to start building that relationship! Would you tell her to take the Career Trip? One hundred percent yes! The fashion industry really has something for everyone. It can be analytical and numbers-based or drawing and technical-focused, while simultaneously revolving around creativity and human interaction. This allows for the exploration of so many fields within one industry! I think that W&L students would greatly benefit from learning about another area of business to which they can apply their skills. ‡UPDATE: We just received word that Carley has just accepted a job at Saks Fifth Avenue next year in their Merchant Development Program. Congratulations, Carley! The best place to eat in Lexington is Blue Sky. My favorite thing to order is the brie & bacon focaccia and the Blue Sky bar (the best dessert ever!). How close-knit the W&L community is on campus and after graduation. My favorite class I am currently taking is the 2016 Political Election with Professor Strong. Not very original, but I’d have to say the Colonnade in spring … It’s just so beautiful. I trained as a competitive badminton player for 10 years! I was even nationally ranked in Canada for a moment. I grew up wanting to go to school in the States, particularly at a liberal arts school with a beautiful campus. My grandparents actually retired to Lexington 25 years ago, so I’ve been coming here for my whole life! When I reached the age to start looking at schools, W&L was a natural fit.